Celebrating the life and accomplishments of our little boy. God trusted us with one of his angels. It is our mission to help him learn to fly! "Does he have CP? ", she asked. We kept on playing peek-a-boo from the tiny play cabin next to the elevators in the Great Wolf Lodge, WI Dells, as we answered the now so repeated question. By this time, we were getting used to the public stares, questions, looks of sadness. We took a mini vacation last week to The Great Wolf Lodge. Celebrations were in order as Bryan got a new job! Yeah! He started this week, so last week we said the Thayers were overdue for some family fun. The boys had a blast! Enormous waterpark with kiddie wading pools, family slides, lazy river....perfect for Rojo in his gait trainer to splash around. Gunnar got a few bumps and bruises from trying to keep up with the big kids, but is no worse for the wear. Mom and Dad had their hands full running after the boys. Between waterparks, singing animals, arcade action, and play spots everywhere... No vacation for us! "Yep. ", I answered, as Gunnar took off down the hall, leaving Roa giggling from his wheelchair beside the window of the little log cabin. Auntie Vickie took off after him. We were gifted with a little time off when Vickie showed up and surprised us! She watched the boys so we could have a drink at the lodge bar. AHHHH.. She also took Roa swimming one afternoon so we could do a little shopping. "I saw you yesterday at the waterpark when he was in his Pony", She said. Pony- a kind of gait trainer- she is familiar with the Land of CP. "Yeah? ", both Bryan and I said. Taking an interest in this stranger who might have some insight. "My name is Stacy. My son had CP. When I saw your son running through the water laughing yesterday, it was like I saw a ghost! Lucas past away 6 years ago YESTERDAY to the date. Your son looks so much like him." 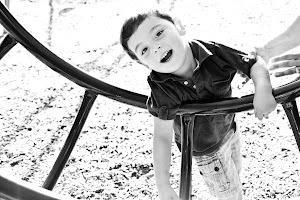 Stacy went on to share that Lucas had a feeding tube and frequent aspiration. He passed away after complications with pneumonia. He was 4. Bright and happy. Running around in his gait trainer just like Roa. She was sad this anniversary of his passing and seeing Roa just brightened her day! We shared stories of doctor visits, equipment trials, Hyperbaric therapy and aquatic time. We smiled, laughed, and teared up. Our visit was short due to the King's need to head back to the Fun, but it was memorable. God puts you together with the ones that understand. He places these comrades in unlikely places just went you start to feel down. When the feelings of being so different in the world when sometimes you just want to blend in with the other sheep are overwhelming. Roa runs in his gait trainer through the water sprays and wading pools for you, Stacy and Lucas! Roa will run on and have his own form of fun. Roa is moving his arms and legs in alternating crawling pattern. We started a brushing program with Roa last week, via Kara, OT Functional kids. Six to eight times a day, we brush his body firmly with a surgical brush. The brushing of limbs and back is then followed by joint compressions. The brushing program is a protocol used to help sensory processing and increase body awareness. We add it to our bag of CP land treats. Busy busy. Little sleep. Lots of prayers. No job yet for Bryan. We are hopeful for an offer soon. On a positive note, with this time of unemployment, I was able to attend a Craniosacral Therapy weekend seminar with Dr. Carol Phillips. So amazing. So empowering. So enlightening. So much hope. For a new tomorrow. A brighter future. Roa was born on June 24, 2008. It was an average delivery after a tough pregnancy including a car accident during the 5th month. From early on, Roa has issues with reflux, head and trunk control, and muscle tightness. 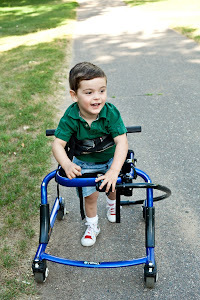 When Roa turned one year, he was diagnosed with Quadraspastic Cerebral Palsy. This is the journal of his life and how he has changed ours!